Police are appealing for information after a petrol bomb was thrown at a house in Ballymena this morning. 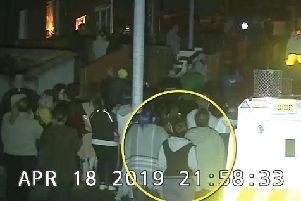 It is understood the incident, which occurred in the Railway Street area of the town, was reported to police at approximately 12.15am. Detective Sergeant Peter Crothers said: “Two bricks were thrown at the property, smashing a front room window, followed by two petrol bombs, one of which hit the house. “There was scorch damage caused around a window frame and the front door of the property. Anyone with information is asked to contact detectives on the non emergency number 101, quoting incident reference number 9 23/02/18.